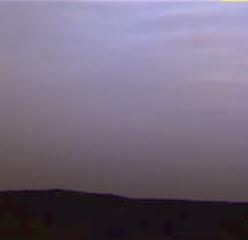 Mars has a very thin atmosphere, as seen in this photo. The atmosphere of Mars is the layer of gases surrounding Mars. It is mainly made up of carbon dioxide. The average atmospheric pressure of the Martian surface (6.0 mbar) is much lower than that of the Earth (1,013 mbar). The pressure is well below the Armstrong limit, meaning that water boils at the normal temperature of the human body: 98.6 °F (37.0 °C). The Martian atmosphere contains 96% carbon dioxide, 1.9% argon, 1.9% nitrogen, and traces of oxygen, carbon monoxide, water and methane, and so on. Ever since the discovery of methane in 2003, scientists say that this might indicate life. It has also been suggested that is may be caused by geochemical processes, volcanic or hydrothermal activity. The atmosphere of Mars is quite dusty, giving the Martian sky a light brown or orange-red color when seen from the surface. Data from NASA pointed out that the dust particles are 1.5 micrometres diameter. On 18 March 2015, NASA found an aurora that is not fully understood and an unexplained dust cloud in the atmosphere of Mars. Many studies have found that the atmosphere of Mars has been weakened over time due to solar winds. On Earth, the magnetic field protects us from most of the wind. Mars used to have a magnetic field, but cooling of the core has resulted in the magnetic field being lost. Rotation of Mars near opposition. Ecliptic south is up. Atmosphere of Mars Facts for Kids. Kiddle Encyclopedia.